There are a couple of good reasons for converting .doc files to .docx before translating them in Trados Studio. I’ll explain why later. If you’ve got just one file to convert, it’s simple to open it in Word and save it as .docx. But how can you batch convert a group of files all at the same time? A little while ago I was sent 15 .doc files to translate. I searched for an app or macro that would batch convert them but didn’t find a good solution. Kutools for Word does the job, but I didn’t want to download a whole set of macros and extra toolbars along the way. There was a macro on a Microsoft forum, but it didn’t work for me. So I sent out a Tweet to see if any other translators had a solution. @HiFiText (Shai Nave) came up with the answer. He’s very kindly let me share it here. Here’s the macro that does the trick (for me at least). The only thing to remember is that you need to have all the files in the same folder to perform the batch convert. With .docx files, you can add comments in Studio and retain them in the target Word file. 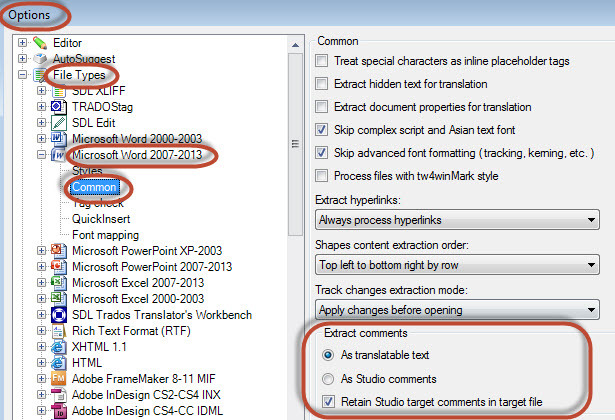 This useful option made a brief appearance in Studio 2011 (and then disappeared) and it’s back in Studio 2014. You can adjust the settings for comments under File Tab>Options>File Types>Microsoft Word 2007-2013>Common. Many thanks to Shai for sharing this time-saver! This entry was posted in 2. Beyond the Basics, SDL Trados Studio and tagged batch convert, doc to docx, docx files, how-to, macro, SDL, Studio 2014, track changes, Trados. Bookmark the permalink. Thanks for the heads-up, John. I don’t have LibreOffice on my machine (and I’m trying to keep my new work environment as clean and fresh as possible), but it’s great for anyone who does. And I see you can also convert many different file types using the LibreOffice command line. One more reason for using DOCX over DOC, although generally lesser in importance than the ones you have mentioned, is that in this point in tome Studio’s DOC file definition is pretty much for legacy purposes and as far as I can tell no longer actively maintained. This means that any any DOC specific quirks and kinks are unlikely to be ironed out. While LibreOffice is a great productivity suite in its own right, I personally wouldn’t trust it too much for accurately converting DOC files into DOCX, especially in a production environment. It’s fine for an occasional use, but from my experience complicated layouts could potentially get broken. Moreover. I also prefer a self contained solution that doesn’t require installation of additional components (unless absolutely necessary) to perform a certain function. For those who don’t afraid of the command line (and no one should), the conversion could also be achieved via a PowerShell script, but I think that most users will find the Macro approach more effective and straightforward. What I would like to see Studio evolving into is a self-contained unit that doesn’t require MS Office to to process the relevant files (like MemoQ does). I was just looking for a way to do this the other day. Got lucky here. I’m going to have to give that a try! Thanks. Docx files are also considerably smaller than doc files. Another reason to make the switch! It appears that the conversion is making it so backwards compatibility is still active. Makes it so files don’t compress as much as possible. The only way to do this when converting manually is to click the check box. Is there something in the macro causing this that I could change to make it so the documents lose compatibility with the old formats? Other than that problem, this macro is great. Desperately need it to lose compatibility though. ~ 50,000 files need to be converted and losing compatibility will save a lot more space on the server. Please help! Thank you. Hi Mike. I didn’t realise that keeping compatability affects file size. This setting is off by default when you save files as docx manually so I’m not sure why it’s happening in the macro, which doesn’t seem to have a “CompatibilityMode” line. Maybe you could ask on a Microsoft forum?